Description of fields used when entering or importing archival descriptions using Rules for Archival Description in a CSV file or entering the data manually. To download the Rules for Archival Description CSV template for AtoM, please visit our wiki page (link to come). RAD is maintained by the Canadian Council of Archives and is available at http://www.cdncouncilarchives.ca/archdesrules.html. RAD Rule refers to the rule from the applicable standard and/or the instructions provided by AtoM. Notes includes any other information needed for successful data entry or CSV import. The data entry fields for the Title and statement of responsibility area. The EAD tag <titleproper encodinganalog="title"> refers to the title of the finding aid, not the archival description. Although the RAD standard specifies set values for General Material Designations, in AtoM these can be edited in the Material type taxonomy (see: Add a new term). As of 2.2, the RAD template also has a separate Genre taxonomy, which uses the <genreform> EAD element as well, but without the @source and @encodinganalog attributes. RAD Rule Select a level of description from the drop-down menu. See RAD 1.0A for rules and conventions on selecting levels of description. An administrator can edit the values in the Levels of description taxonomy (see: Add a new term). In CSV import, if a term is used that is not already in the taxonomy, it will be added to the Levels of description taxonomy. RAD Rule Identifier: Enter an unambiguous code used to uniquely identify the description. Level: Select a level of description from the drop-down menu. See RAD 1.0A for rules and conventions on selecting levels of description. Title: Enter the title proper, either transcribed or supplied (RAD 1.1B). This widget has been added to help improve workflows when creating new descriptions via the user interface. When entering descriptions manually, users can add new child records in this area while creating a parent record. The dates field corresponds to a date of creation - if you would like a different kind of date, you will have to either navigate to the child description after saving the new parent record, and change the date type, or simply ignore the date field in the widget, and add the correct date type manually to the child record after saving the new parent record. In CSV import, adding child records can be achieved using the legacyID and parentID columns. See Legacy ID mapping: dealing with hierarchical data in a CSV. RAD Rule Select the repository that has custody and control of the archival material. The values in this field are drawn from the Authorized form of name field in archival institution records. Search for an existing name by typing the first few characters of the name. Alternatively, type a new name to create and link to a new archival institution. When linking an archival institution to an archival description, You should only link at the highest level of description. AtoM will automatically inherit the repository name at lower levels. This conforms to RAD’s General Rule 1.0A2d Non-repetition of information: “Do not repeat information at a lower level of description that has already been given at a higher level….” Linking a repository at all levels of description (instead of just at the parent level) in a large hierarchy can also impact performance. RAD Rule Enter an unambiguous code used to uniquely identify the description. This field displays to non-logged in users as “Reference code.” While editing the record, the full reference code including any identifiers inherited from higher levels will appear below the Identifier field. The @countrycode value is taken from the Country value entered into the Contact area of the related repository. In the CSV templates, the columns can accept multiple values, separated by a pipe | character. The label values will be matched 1:1 with the identifiers. The data entry fields for the Edition area. This field also maps to the <editionstmt><edition> tag in <eadheader><filedesc>. The data entry fields for the Class of materials specific details area. These fields are found in the CSV template but when entering descriptions manually are found in the authority record. However, the description can be linked to the authority record while entering the data manually. RAD Rule Use the Actor name field to link an authority record to this description. Search for an existing name in the authority records by typing the first few characters of the name. Alternatively, type a new name to create and link to a new authority record. This is the default export EAD when an Entity type has not been set for the actor on the related authority record. The final EAD element can be more precise, if the user has entered an Entity type on the related authority record. When the Entity type is set to Person, the EAD will export using <persname> instead of <name>; when set to Family, the EAD will export using <famname> instead of <name>; and when set to Organization, the EAD will export using <corpname> instead of <name>. The <name> element is the default when no entity type is set. For more information on authority records and the ISAAR standard upon which the authority record template is based, see: Authority records and International Standard Archival Authority Record for Corporate Bodies, Persons, and Families. In the CSV template, this column can accept multiple values, separated by a pipe | character. The label values will be matched 1:1 with the identifiers. When linking a creator to an archival description, you should only link at the highest level of description. AtoM will automatically inherit the creator name at lower levels. This conforms to RAD’s General Rule 1.0A2d Non-repetition of information: “Do not repeat information at a lower level of description that has already been given at a higher level….” Linking a repository at all levels of description (instead of just at the parent level) in a large hierarchy can also impact performance. See also RAD section 1.7B1. When entering data manually, this field needs to be written in the authority record. If an authority record does not already exist, AtoM will create one when a new creator is entered, above. The user can then navigate to the authority record to enter the Biographical or Administrative history (see: Authority records). When importing descriptions by CSV, by default this column will create a Biographical history in the authority record, regardless of whether the creator is a person, family, or organization. To specify the entity type when importing creators, users would need to import authority records or manually edit the authority record. When roundtripping descriptions from one AtoM instance to another, creator names in the <origination> element are matched 1:1 in order with administrative or biographical histories included in <bioghist>. It is therefore important that if some creators do not have related histories, they appear in the EAD after those that do, so the 1:1 mapping can work as expected. If an extra <bioghist> element is included that does not have a corresponding creator name, a stub authority record will be created to hold the <bioghist> data. When entering data manually, the fields below are accessed by clicking “Add new” in the dates of creation area. Entering an actor’s name will automatically insert the actor’s biographical sketch or administrative history from the authority record. When entering data manually, users can choose an event type from a drop-down menu. The event types can be edited by an administrator in the Event types taxonomy (see: Add a new term). 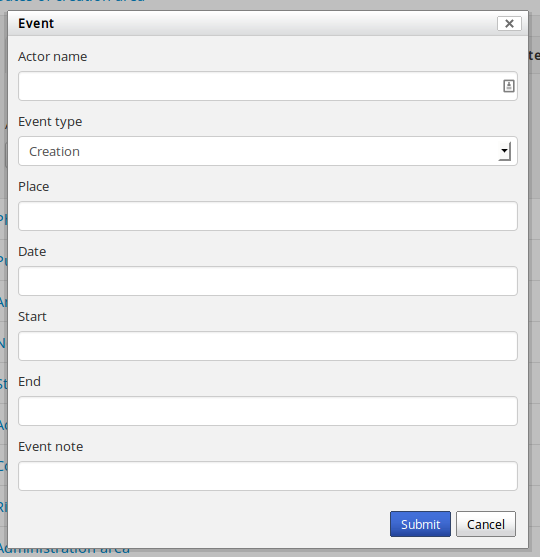 When importing descriptions via CSV, the event type defaults to Creation. RAD Rule “For an item, transcribe the place of publication, distribution, etc., in the form and grammatical case in which it appears.” (RAD 1.4C1). Search for an existing term in the places taxonomy by typing the first few characters of the term name. Alternatively, type a new term to create and link to a new place term. The above example assumes that the place was linked to a creator, as opposed to a publisher, broadcaster, or other role - the @role attribute value will depend on the type of event entered. An example @id is included in this example as well - atom will generate and use these to maintain the relationship between a creator name, date, and place when roundtripping. RAD Rule “Give the date(s) of creation of the unit being described either as a single date, or range of dates (for inclusive dates and/or predominant dates). Always give the inclusive dates. When providing predominant dates, specify them as such, preceded by the word predominant…” (1.4B2). Record probable and uncertain dates in square brackets, using the conventions described in RAD 1.4B5. The CSV column in earlier versions prior to 2.2 was named “creatorDates” - it has been updated to clarify its relation to the creation event - not to the dates of existence of the creator. However, we have added fallback code, so if the old name is used, the import will still succeed. This field will display the date as intended by the editor of the archival description, in the language of the standard being used. The start and end date values, which must be ISO-formatted (YYYY-MM-DD), will populate the @normal attribute. AtoM will also generate an ID to be able to link the creator name, place, and event date again when roundtripping from one AtoM instance to another. The CSV column in earlier versions prior to 2.2 was named “creatorDatesStart” - it has been updated to clarify its relation to the creation event - not to the dates of existence of the creator. However, we have added fallback code, so if the old name is used, the import will still succeed. RAD Rule Enter the start year. Do not use any qualifiers or typographical symbols to express uncertainty. Acceptable date formats: YYYYMMDD, YYYY-MM-DD, YYYY-MM, YYYY. This field only displays while editing the description. If AtoM is able to interpret the start date from the Date(s) field, above, it will autopopulate upon entering. In the EAD, the start and end date values are added to the @normal attribute of the corresponding <unitdate> element. RAD Rule Enter the end year. Do not use any qualifiers or typographical symbols to express uncertainty. Acceptable date formats: YYYYMMDD, YYYY-MM-DD, YYYY-MM, YYYY. The CSV column in earlier versions prior to 2.2 was named “creatorDatesEnd” - it has been updated to clarify its relation to the creation event - not to the dates of existence of the creator. However, we have added fallback code, so if the old name is used, the import will still succeed. This field only displays while editing the description. If AtoM is able to interpret the start date from the Date(s) field, above, it will autopopulate upon entering.In the EAD, the start and end date values are added to the @normal attribute of the corresponding <unitdate> element. The CSV column in earlier versions prior to 2.2 was named “creatorDatesNotes” - it has been updated to clarify its relation to the creation event - not to the dates of existence of the creator. However, we have added fallback code, so if the old name is used, the import will still succeed. The data entry fields for the Physical description area. RAD Rule “At all levels record the extent of the unit being described by giving the number of physical units in arabic numerals and the specific material designation as instructed in subrule .5B in the chapter(s) dealing with the broad class(es) of material to which the unit being described belongs.” (RAD 1.5B1) Include other physical details and dimensions as specified in RAD 1.5C and 1.5D. Separate multiple entries in this field with a carriage return (i.e. press the Enter key on your keyboard). AtoM will allow users to add additional EAD subelements to field in the edit page, to accommodate all the possibilities in EAD for more granularity, such as <extent>, <dimensions>, <physfacet>, and <genreform>. In the view page the EAD tags will be hidden, but preserved during export and re-import. The data entry fields for the Publisher’s series area. This field maps to the same EAD field as the field in Notes area below, Other notes- Publisher’s Series. Both notes refer to RAD 1.8B10. The data entry fields for the Archival description area. The data entry fields for the Notes area. RAD Rule “Record the language or languages of the unit being described, unless they are noted elsewhere or are apparent from other elements of the description.” RAD (1.8.B14). Use a three-letter language code from ISO 639-2 when importing from CSV. RAD Rule “Record the language or languages of the unit being described, unless they are noted elsewhere or are apparent from other elements of the description. Also note any distinctive alphabets or symbol systems employed.” RAD (1.8.B14). Not intended to duplicate information from language or script, above. Rights, especially Make rights actionable on digital objects and Add rights to an Archival description. RAD Rule For associated material, “If records in another institution are associated with the unit being described by virtue of the fact that they share the same provenance, make a citation to the associated material at the fonds, series or collection level, or for discrete items, indicating its location if known.” (RAD 1.8B18). For related material, “Indicate groups of records having some significant relationship by reason of shared responsibility or shared sphere of activity in one or more units of material external to the unit being described.” (RAD 1.8B20). At this time, the RAD Cast note field in AtoM has not been mapped to the EAD import/export. At this time, the RAD Credits note field in AtoM has not been mapped to the EAD import/export. 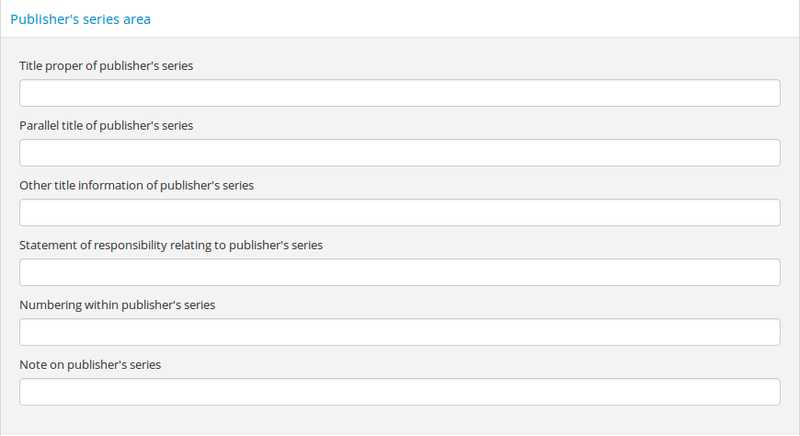 This column maps to the same EAD field as the column above, Note on Publishers Series. Both notes refer to RAD 1.8B10. See also: RAD 4.8B7 (Graphic materials); RAD 5.8B6 (Cartographic materials); RAD 6.8B6 (Architecture and technical drawings); RAD 11.8B7 (Objects); and RAD 12.8B7 (Philatelic records). At this time, the RAD Signatures note field in AtoM has not been mapped to the EAD import/export. RAD Rule “Use this note to record any other descriptive information considered important but not falling within the definitions of the other notes. (RAD 1.8B21). The data entry fields for the Standard number area. The data entry fields for Access points. The values in this column/field will create terms in the subjects taxonomy where those do not already exist. The values in this column/field will create terms in the places taxonomy where those do not already exist. 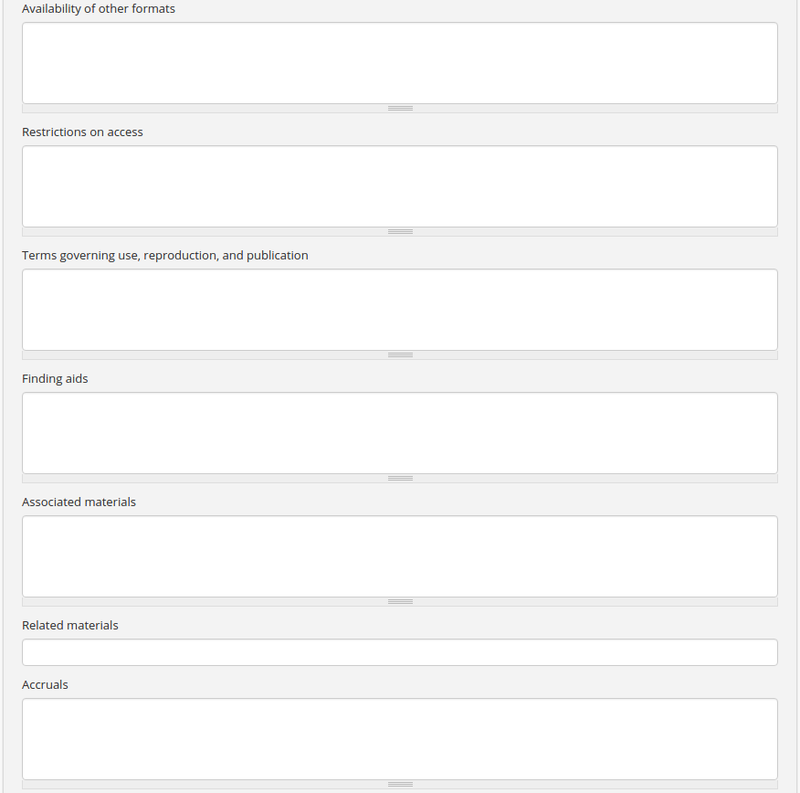 The Genre taxonomy access points were added to AtoM in version 2.2. Currently the access point field is only available on the RAD template, though we hope to make it available on the ISAD and DACS in the future. At this time, it has not been added to the CSV import templates. The Genre taxonomy comes pre-populated in AtoM with genre/documentary form terms. All 45 terms included have been taken from the US Library of Congress’ “Basic Genre Terms for Cultural Heritage Materials,” available at: http://memory.loc.gov/ammem/techdocs/genre.html. All terms can be edited or deleted by users, and new ones can be added. 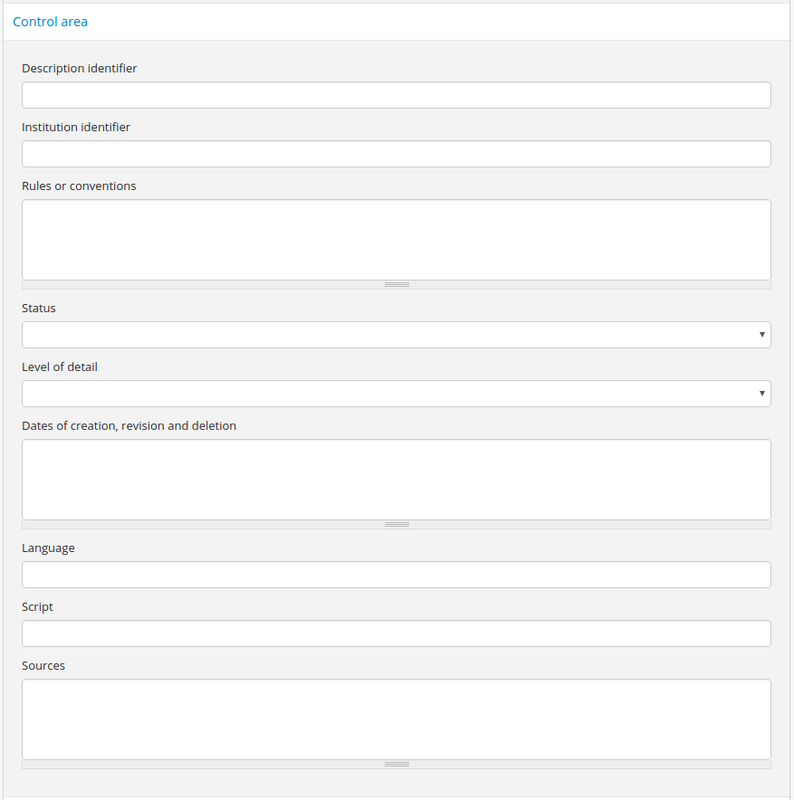 When using the Genre access point field in the RAD template, new values added in this field will create terms in the Genre taxonomy where those do not already exist. The Genre terms can be used as a facet in the Browse and search pages. The label on the facet can be customized by an administrator via Admin > Settings > User interface labels. See: User interface labels. RAD Rule “Choose provenance, author and other non-subject access points from the archival description, as appropriate. All access points must be apparent from the archival description to which they relate.” (RAD 21.0B) The values in this field are drawn from the Authorized form of name field in authority records. Search for an existing name by typing the first few characters of the name. Alternatively, type a new name to create and link to a new authority record. This field is an auto-complete - the drop-down will suggest existing authority records as you type. Values in this column/field that are entered instead of selected from the drop-down will create new authority records. The data entry fields for the Control area. More fields continue below the screen shown. For more information on the use of fields in the control area, see control area. AtoM uses a taxonomy to determine the value of this field. The default terms are Final, Revised and Draft, but can be edited through the Manage taxonomy screen. AtoM uses a taxonomy to determine the value of this field. The default terms are Full, Partial and Minimal, but can be edited through the Manage taxonomy screen. 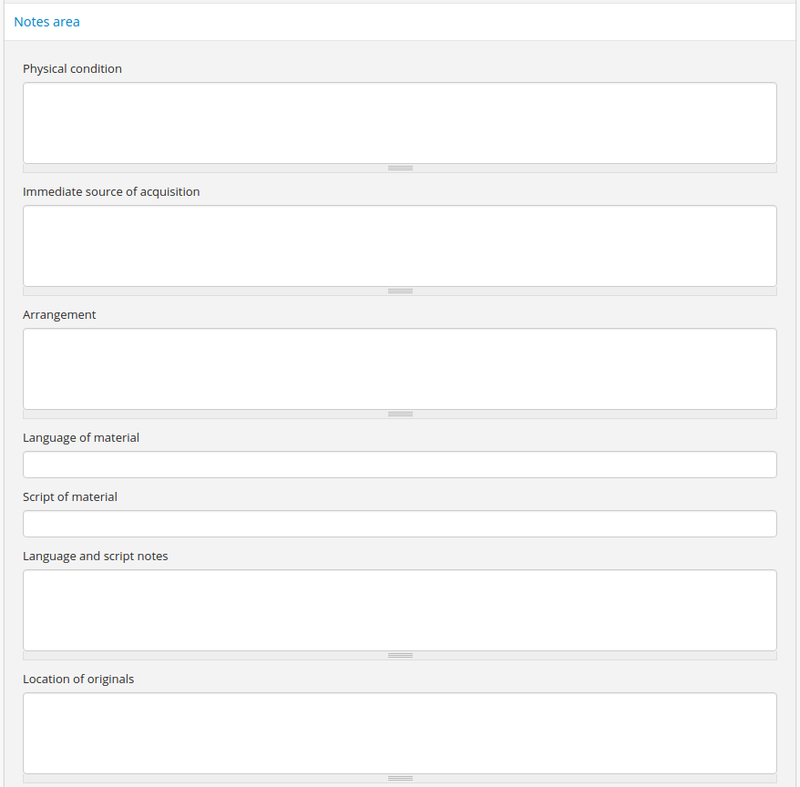 This is a free text field, allowing users to also write narrative notes about the revision history of the description. In CSV import, use a three-letter language code from ISO 639-2 . When entering data manually, AtoM will offer an autocomplete drop-down list as you type, which will be generated as a three-letter language code in the EAD. In CSV import, use a four-letter script code from ISO 1924. When entering data manually, AtoM will offer an autocomplete drop-down list as you type, which will be generated as a four-letter script code in the EAD. If there are sources to cite used used in a biographical sketch or administrative history, record these in the sources field for the authority record. This area of the description allows users to enter a rights record compliant with PREMIS. These fields are separate from the RAD rights notes, above, and editing one area does not effect the other. Rights records cannot be imported with descriptions via CSV. At present, the PREMIS rights added to a record are only visible to authenticated (i.e. logged in) users. For more information, see Rights, especially Add rights to an Archival description, and Preservation Metadata: Implementation Strategies v2.2 (PREMIS). The data entry fields for the Administration area. 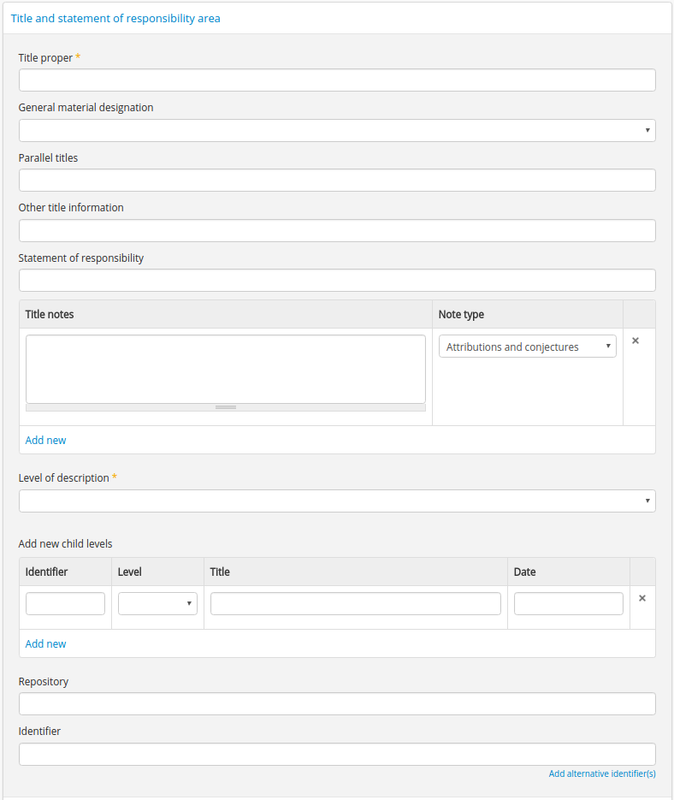 This fields allows the user to choose a different display standard from the default template for the shown archival description only, with the option to also change the display standard for all existing children of the description. See: Change the display standard. Template field Publication status is available under the More tab located on the object view screen. The publication status refers to the public visibility of a description for unauthenticated (e.g. not logged in) users. The default terms available are “Published” (i.e. visible to public users), and “Draft” (e.g. not visible to public users). See: Publish an archival description. In the Global Site Settings, if the default publication status is set to draft, all imported descriptions will be set to draft and the EAD file will have the value “draft” in the <odd type=”publicationStatus”> tag.